1. Period of vibration or time period: It is the time interval after which the motion is repeated itself. The period of vibration is usually expressed in seconds. 2. Cycle: It is the motion completed during one time period. 3. Frequency: It is the number of cycles described in one second. In S.I. units, the frequency is expressed in Hertz (briefly written in Hz) which is equal to one cycle per second. 1. 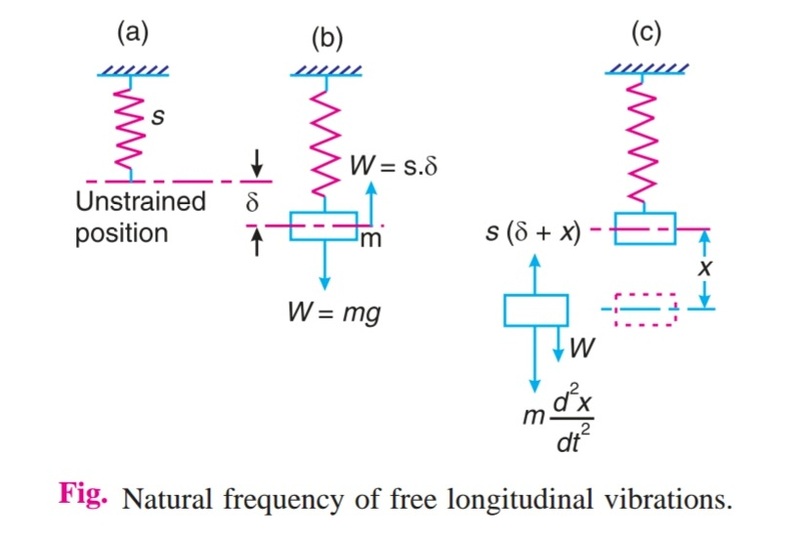 Free or Natural vibrations: When no external force acts on the body, after giving it an initial displacement, then the body is said to be under Free or Natural vibrations. The frequency of the free vibrations is called Free natural frequency. 2. Forced vibrations: When the body vibrates under the influence of external force, then the body is said to be under Forced vibrations. The external force applied to the body is a periodic disturbing force created by unbalance. The vibrations have the same frequency as the applied force. Note: When the frequency of the external force is same as that of the natural vibrations, resonance takes place. 3. Damped vibrations: When there is a reduction in amplitude over every cycle of vibration, the motion is said to be Damped vibration. This is due to the fact that a certain amount of energy possessed by the vibrating system is always dissipated in overcoming frictional resistance to the motion. 1. Longitudinal vibrations, 2. Transverse vibrations, and 3. 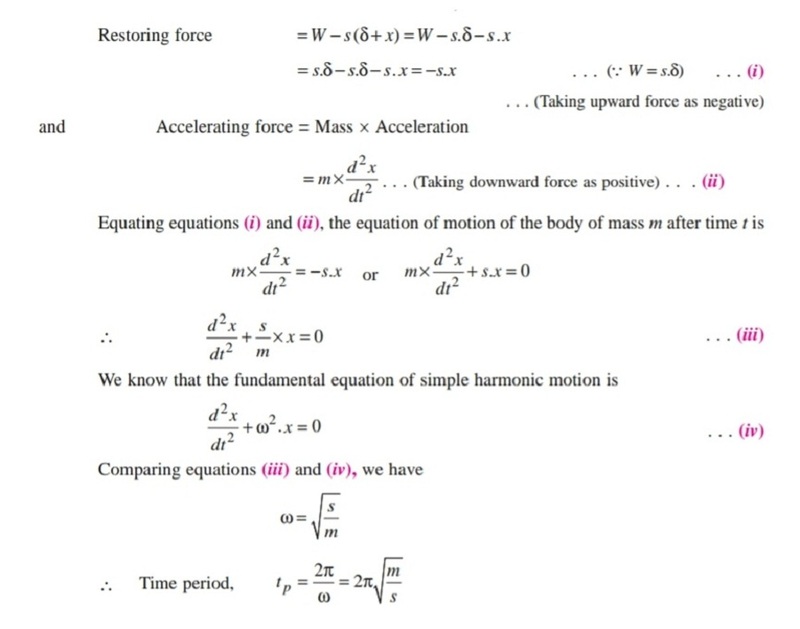 Torsional vibrations. 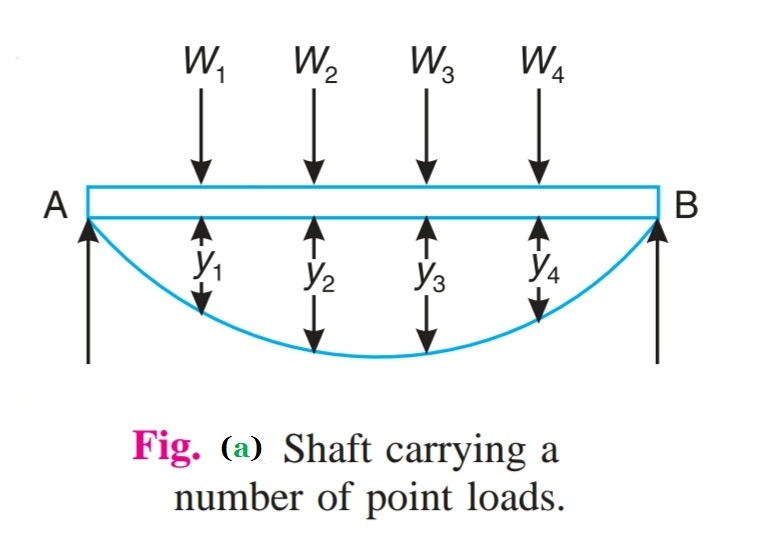 Consider a weightless constraint (spring or shaft) whose one end is fixed and the other end carrying a heavy disc as shown in Fig., This system may execute one of the three above mentioned types of vibrations. 1. 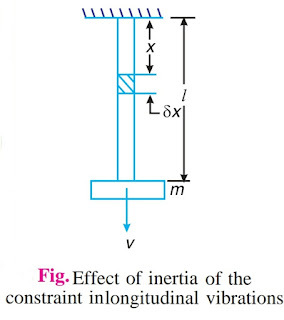 Longitudinal Vibrations: When the particles of the shaft or disc moves parallel to the axis of the shaft, as shown in Fig (a), then the vibrations are known as longitudinal vibrations. 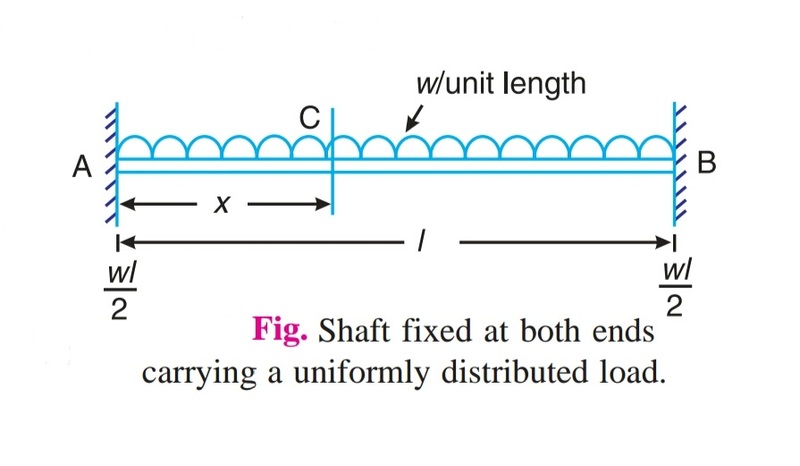 In this case, the shaft is elongated and shortened alternatively and thus the tensile and compressive stresses are induced alternatively in the shaft. 2. 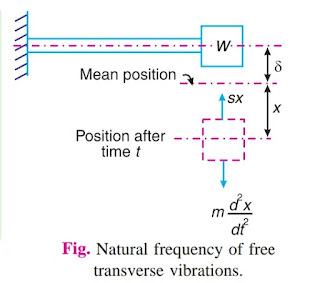 Transverse Vibrations: When the particles of the shaft or disc move approximately perpendicular to the axis of the shaft, as shown in Fig (b), then the vibrations are known as Transverse Vibrations. 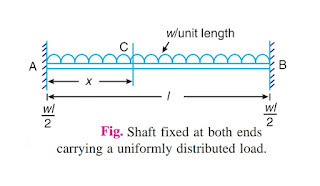 In this case the shaft is straightened and bent alternatively and bending stresses are induced in the shaft. 3. 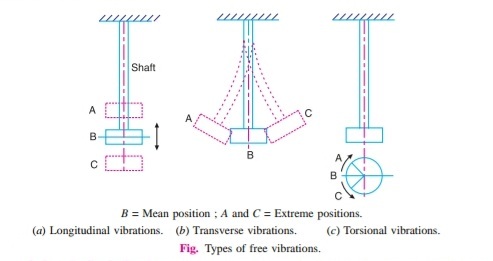 Torsional Vibrations: When the particles of the shaft or disc move in a circle about the axis of the shaft, as shown in Fig (c), then the vibrations are known as Torsional vibrations. In this case, the shaft is twisted and untwisted alternatively and the torsional shear stresses are induced in the shaft. 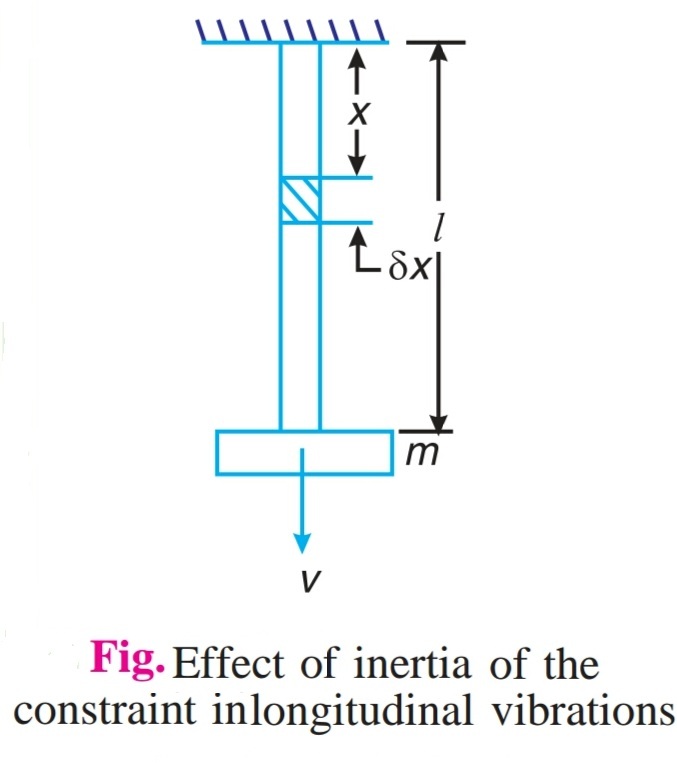 Note: If the limit of proportionality (i.e., stress proportional to strain) is not exceeded in the three types of vibrations, then the restoring force in longitudinal and transverse vibrations or the restoring couple in torsional vibrations which is extended on the disc by the shaft ( due to the stiffness of the shaft) is directly proportional to the displacement or mean position. 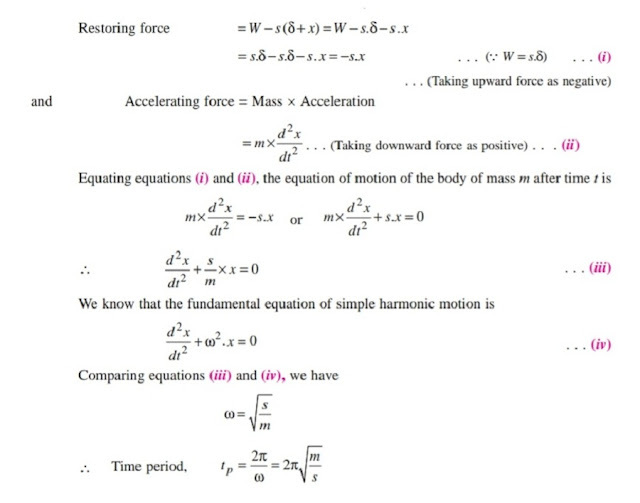 Hence it follows that the acceleration towards the equilibrium position is directly proportional to the displacement from that position and the vibration is, therefore, simple harmonic. 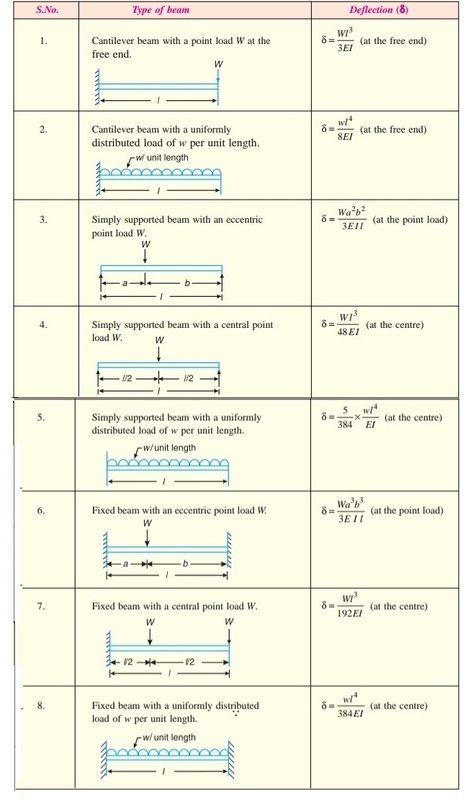 Let s = Stiffness of the constraint. It is the force required to produce unit displacement in the direction of vibration. It is usually expressed in N/m. 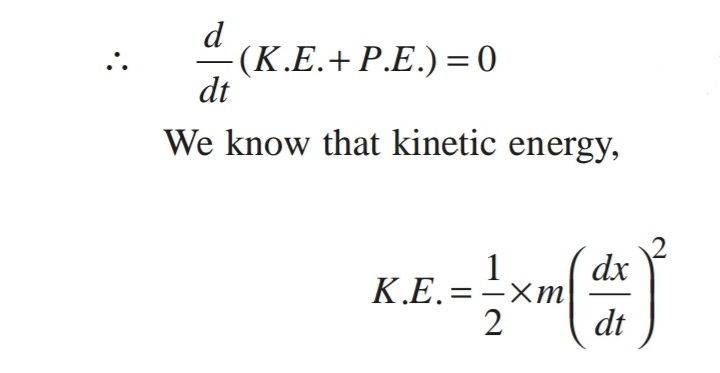 x = Displacement given to the body by the external force, in metres. In the equilibrium position, as shown in Fig (b), the gravitational pull W = m.g, is balanced by a force of spring, such that W = s. δ. A = Cross-sectional area of the constraint. 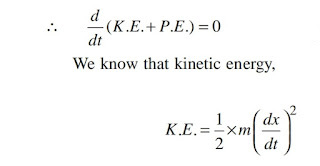 We know that the kinetic energy is due to the motion of the body and the potencil energy is with respect to a certain datum position which is equal to the amount of work required to move the body from the datam position. 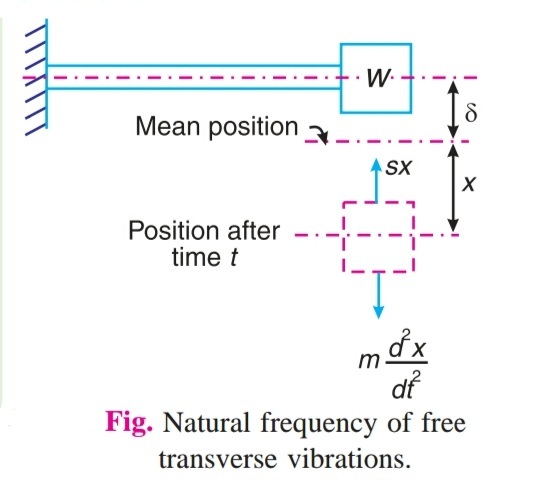 In the case of vibrations, the datam position is the mean or equilibrium position at which th potencial energy of the body or the system is zero. 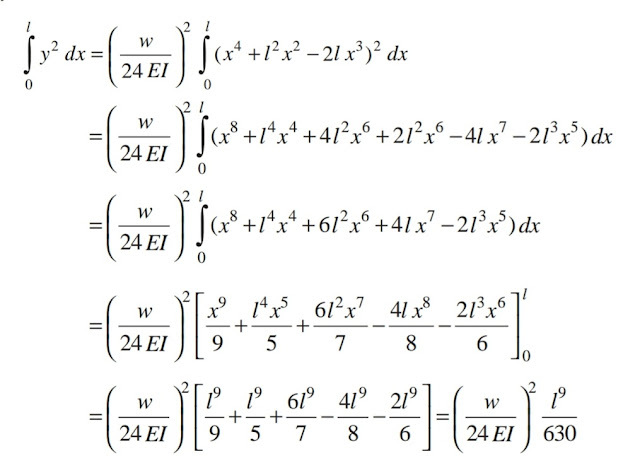 The time period and the natural frequency may be obtained as discussed in the previous method. In all the expressions, 'ω' is known as natural circular frequency and is generally denoted by 'ω n' . 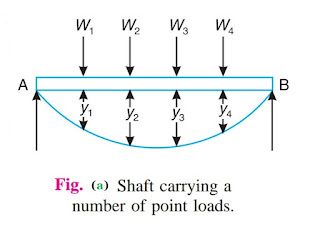 Consider a shaft of negligable mass whose one end is fixed and the other end carries a body of weoght W, as shown in fig. 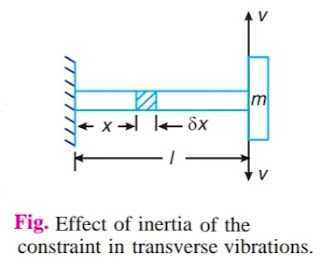 x = Displacement of body from mean position after time t.
I = Moment of inertia of the shaft or beam in m4. 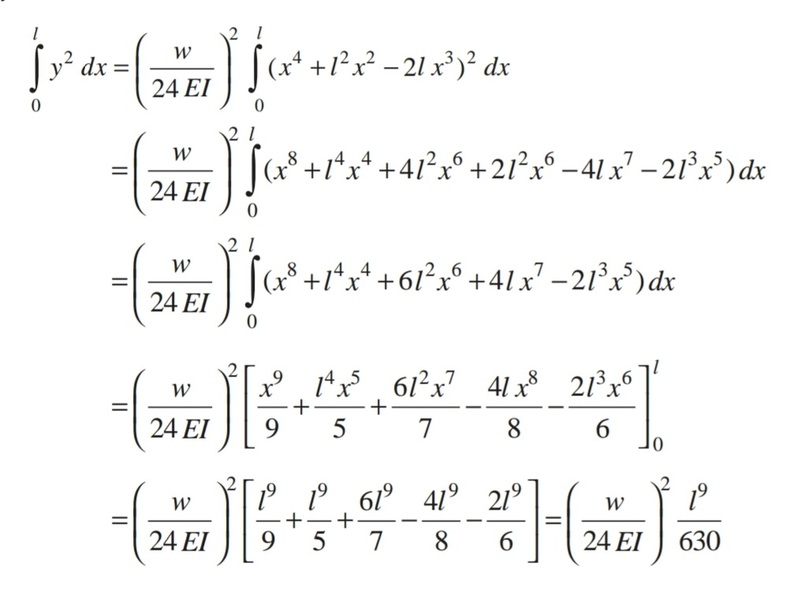 Consider the constraint whose one end is fixed and other end is free as shown in Fig. 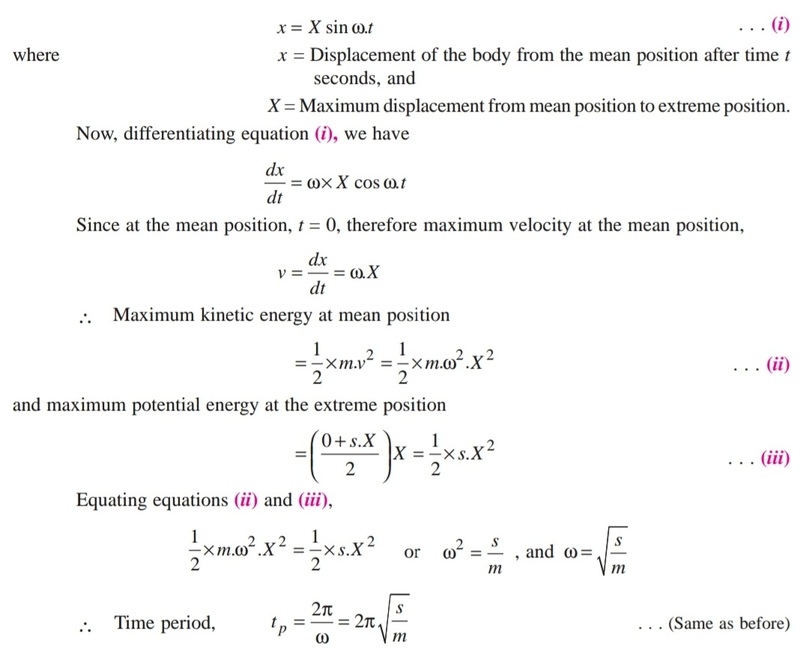 v = Longitudinal velocity of the free end. 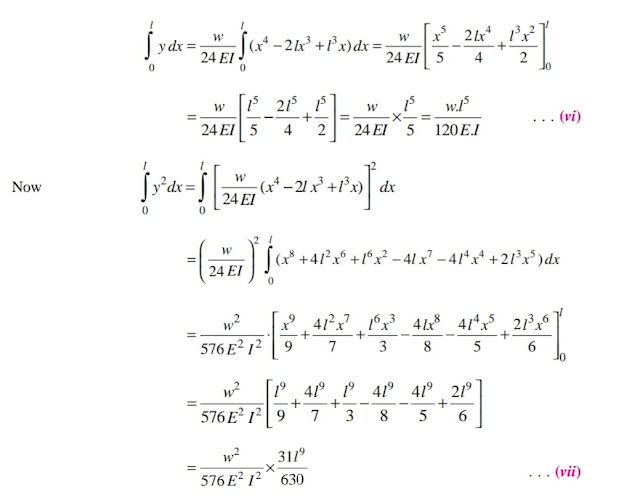 Consider a small element of the constraint at a distance x from the fixed end and of length δx. Hence the two systems are dynamically same. Therefore, inertia of the constraint may be allowed for by ading one-third of its mass to the disc at the free end. 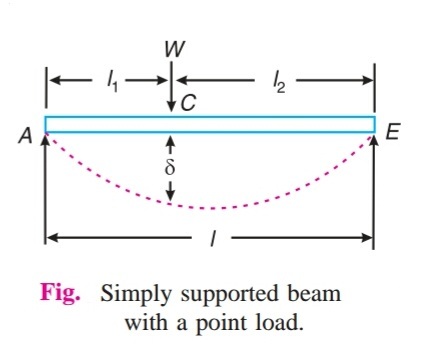 Consider a constraint whose one end is fixed and the other end is free as shown in Fig.. Hence the two systems are dynamically same. 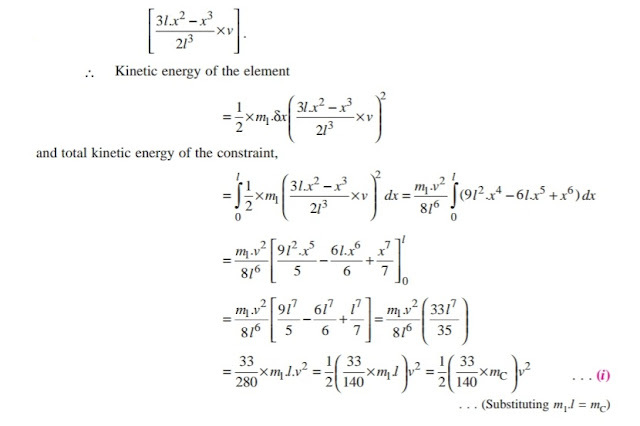 Therefore, inertia of the constraint may be allowed for by adding 33/140 of its mass to the disc at the free end. 1. If both the ends of the constraint are fixed, and the disc is situated in the middle of it, then proceeding in the similar way as discussed above, we may prove that the inertia of the constraint may be allowed for by adding 13/35 of its mass to the disc. 2. 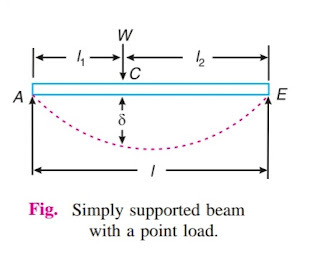 If the constraint is like a simply supported beam, then 17/35 of its mass may be added to the mass of the disc.